This caricature is of the eccentric comedian T. E. Dunville. It was probably done when he was topping the bill at the Hippodrome, Stoke-on-Trent, during the week of 22 January 1906. His act consisted of singing funny songs with comical patter and telling ‘wonderful fairy tales’. It is one of the many superb caricatures of Edwardian music hall performers that were drawn by the artist George Cooke when he was based at the Grand Theatre of Varieties, Hanley. He compiled them in a series of albums. T. E. Dunville (born Thomas Wallen), took his stage name from a brand of whisky. He was born in Coventry with a withered arm in 1867. He worked in northern music halls before coming to London in 1890 and appearing at the Middlesex and Gatti’s. Billed as an ‘eccentric comedian and contortionist’, he was an immediate hit with the song ‘Lively On, Lively Off’. He remained a leading music hall performer for 25 years. Acrobatics and ‘legmania’ were a feature of his act, with idiotic songs including ‘Walk-Walk-Twenty Miles a Day’, ‘Whoa There, Back Pedal’, ‘Bunk-i-Doodle-Di-Do’ and ‘Dinky Doo’. They were sung in a jerky manner but extremely fast. Dunville died in 1924. Pen, ink and wash caricature on pink paper of T.E. Dunville with a red nose and black crescent-shaped eyebrows, wearing a black belted jacket, black trousers and boots. He is marching to his right with straight legs, his left arm straight at his side, his right arm in the air. 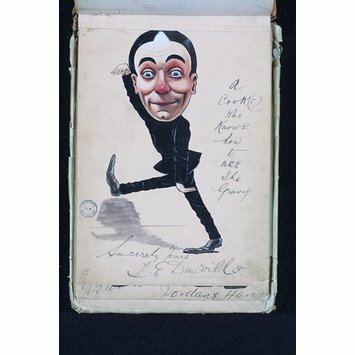 This caricature is of the music hall performer T.E. Dunville (1867-1924) the tall, eccentric comedian with a jerky style of singing idiotic songs at an express rate. Born Thomas Edward Wallen in Coventry in 1867, he adopted the name 'Dunville' from a whisky firm. He built up a successful reputation in the north before coming to England where he first appeared at the Middlesex music hall, Gatti's and the Foresters. He was an immediate success with his main song 'Lively On, Lively Off'. The caricature comes from the second album of caricatures in a collection of albums owned by the Theatre Museum compiled by the graphic artist George Cooke. It is labelled by the artist 'Geo Cooke HYS BOOKE' and features music hall performers working in the early 20th century. 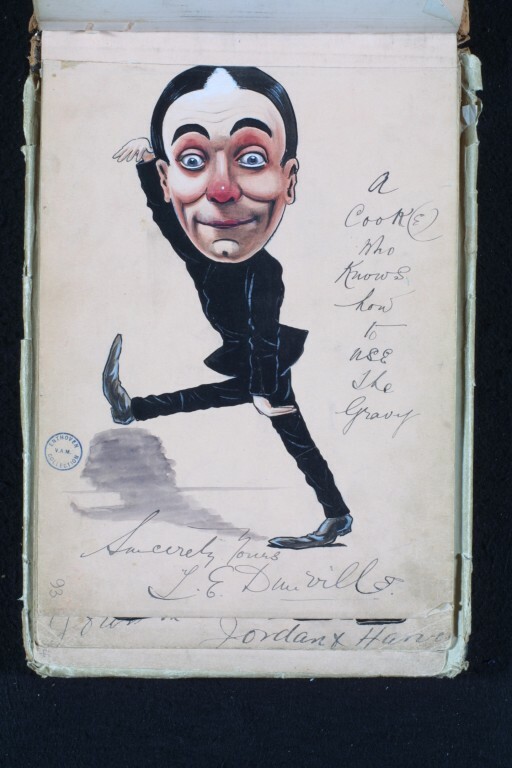 Caricature of the Edwardian music hall performer, the eccentric comedian T.E. Dunville (born Thomas Wallen, 1867-1924), from an album of caricatures drawn by George Cooke. January 1906. 'The Autobiography of an Eccentric Comedian' by T.E. Dunville, published by Everett & Co.